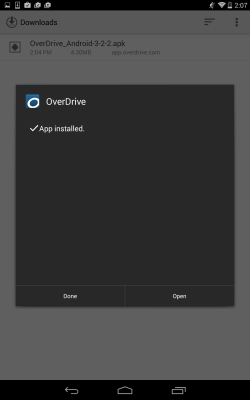 If you have an Android device that doesn't have access to the Google Play Store or the Amazon Appstore, follow the instructions below to install the OverDrive app directly. Select download for Android OS 4.0 (or newer) at the bottom of the page. Review the license agreement and tap I Agree to download the installation file. 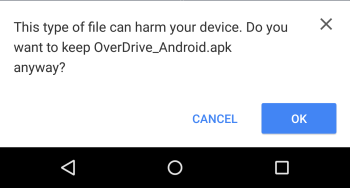 You may get a warning saying that this kind of file can harm your device. This is normal, and we test our installer to make sure it's safe. Once the file downloads, open it from your notification bar. If prompted, open the file with the "Package Installer." 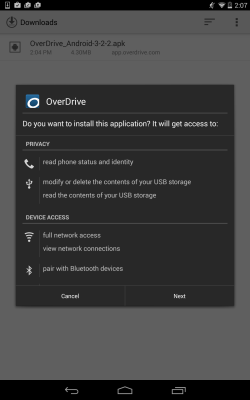 Review the permissions, then tap Install (or Next). Tap Open to launch the app, or tap Done to close the installer.